Edinburgh Napier University. It was a lovely conference from start to finish, but this post isn’t about that. 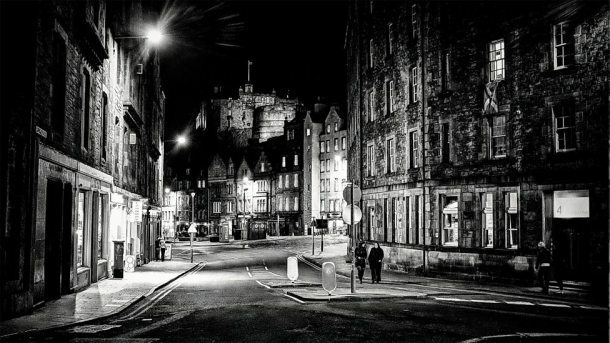 It’s about crime fiction and Edinburgh itself. It also raises some more general questions about the crime genre. It was my first time in Scotland, and I was excited to be visiting a city I felt I knew through the fiction of Ian Rankin, which, in the author’s words, ‘explore[s] contemporary Edinburgh and take[s] the reader into the City’s secret heart, where few tourists go’; that is, a place that isn’t just straightforwardly pretty but is riddled with vice and crime and injustice. Stepping off the train, I was immediately struck and not surprised by the gaudy excess of Edinburgh Waverley Station – glass, coffee, and technology as far as the eye could see, befitting a capital. Through the glass ceiling I could see some beautiful buildings and a rural view that screamed national heritage. Everybody had told me that this part of the world was beautiful, and I could see that right away. Stepping out of the station, however, something else jumped up with all the bluntness of a crime writer’s allegory. Poverty was etched into the paving stones. Fluids both chemical and bodily, solids of every known provenance, abandoned bits worn and worn and worn – humiliation had grown into the brickwork, as solid as the cement. But before I’d seen any of this, a lady, huddled in blankets and literally in the doorway, asked me for change. When I gave her what I had she seemed genuinely shocked, like no one had even seen her all day. She was impossible not to see; impossible not to hear. I’ve studied and worked in Exeter and Cambridge, two cities with massive – famously massive – rich-poor divides, but I have never seen the divide so sharp and so brutal as it was in Edinburgh. My time exploring the city was virtually non-existent; I walked from the station to the hotel, the hotel to the university, and those two journeys in reverse. My spare time was spent marking, so perhaps I didn’t do the tourist thing properly, but my experience was not one of delightful, uncomplicated luxury. The poverty and disadvantage were not things hidden. Every time I stepped out of the hotel – literally every time – I got talking to someone without a home, including a gang member, and every big building I passed had a blanketed figure on its doorstep, begging for enough money to eat. You would need a heart of stone to go through that city and think that there wasn’t a problem. This made me think – how amazingly revolutionary is the Tartan Noir genre of literature? For years, I’ve been spouting the critical consensus; the idea that, like Scandi Noir after it (and perhaps this needs to be problematized? ), it pierces through an idealistic gloss to reveal the secret and simmering struggles that lie beneath. But if the level of secrecy – the level of veneer – is anything like what I saw, then what kind of people are writing or reading this stuff? If you have spent five minutes in central Edinburgh, how could you possibly be shocked by the revelation that the city is ‘a crime scene waiting to happen’ (in Rankin’s words). Yes, the buildings are beautiful, viewed from the train. But once you’re breathing that air it’s impossible to miss the inequality, the inhumanity, the figureheads of underworlds, the absolute charge that should be central to all crime fiction: life isn’t fair. And this got me thinking further … about crime fiction set in Exeter, Cambridge, or Oxford. Nearly all of it sets up those particular cities as uniformly wealthy, its inhabitants living in uncomplicated luxury with a few outliers only going to prove a more general privilege. If Exeter/Oxford/Cambridge crime writers want to introduce a class note, they’ll have a maverick working-class student at the university. And what, really, does that achieve? You don’t read about Exeter’s poverty problem in crime fiction – perhaps because you have to cross the River Exe, beyond the city centre, to see it. In Edinburgh, some of the problems are plain for all to see. So writing about them should be the absolute barest minimum job of a crime novelist; not the radical and shocking twist in their career. For a while now, I’ve been uncomfortable with some of the rhetoric around crime fiction. Like Radio 4 presenters, its authors pat themselves on the backs for being liberal and woke, and continue to perpetuate all kinds of damaging crap. A few years ago, Val McDermid wrote an article for the Guardian, entitled ‘Why crime fiction is leftwing and thrillers are rightwing’.Her thesis was that ‘crime novels are overtly critical of the status quo, while the thriller explores the danger of the world turned upside down’; that the latter genre ultimately requires us to trust certain authorities while the former absolutely does not. It’s a traditional distinction and one that I think is a tad old-fashioned. Increasingly, under the ‘crime’ banner, other distinctions and subgenres are more important than whether we consider the novel to be ‘crime’ (and what is that? People don’t like saying ‘puzzle’ any more, but that’s what they’re thinking) or a thriller. Authors like Sophie Hannah and Elly Griffiths write books that could easily fall into either box. I think that distinction has become a little stale, but it’s licensed a degree of traditionalism in crime writing which can mask a great many ills. The idea that, by describing yourself as ‘not a thriller writer’, you can get away without actually challenging anything because you can rely on the inherited kudos of a presumed literary form. About 9 out of 10 crime novels published now (that’s not a scientific estimate at all) follow the same Francis-Iles-revised-by-Gillian-Flynn format: a young woman comes into money, meets the man of her dreams, realises he’s trying to kill her, decides to kill him first. A gestural nod to terrorism in the subplot, and the occasional gay or black best friend mixed in with the raisins don’t really change this, or the fact that it doesn’t actually tell us anything. We’re supposed to have entered the second golden age of crime writing – and crime fiction recently became the UK’s bestselling genre – but I think it’s clanging its own exuberant death knell. There’s nothing new on our book shelves, despite the radical potential of the literary form. While researching for my PhD I became painfully aware that some communities just are not represented in mainstream crime fiction. A few years ago, at the Noirwich Festival of Crime Writing, Dreda Say Mitchell declared that she was ‘the only black woman writing crime fiction in Britain’. It was taken as a joke, but it wasn’t one. There has never been a major trans detective – in fact, to look for trans representation in bestselling crime fiction we have to go back to McDermid’s The Mermaids Singing (1995) which is … not in any way a positive or productive representation. For anything nuanced or sympathetic, it’s Josephine Tey’s To Love and Be Wise (1951) or Gladys Mitchell’s Speedy Death (1929). One of the great things about crime fiction, which writers like Tey recognised, is that it has the power to provoke debate and to challenge accepted ways of thinking. Tartan Noir has, indeed, been credited with this – changing the frame in which we think about glamorous cities … but bearing in mind my discussion above, who is the ‘we’ in that sentence? Recently, I was consulted by a festival organiser who wanted to know ‘who’s doing exciting work in crime fiction as gender activism’. I could not give them much of an answer. In fact, I came away from that meeting with more of a reading list than the organiser, and ended up devouring some wonderful avante garde takes on the detective novel which are, as far as I know, among the only queer British detective stories around. But, of course, the only people who read avante garde fiction are the same people who write it. And they tend to have, as a bare minimum, a university education. So what is the text actually doing? Who is it talking to? Paradoxically, as (middle-class) critics proclaim that no area is out of bounds in crime fiction, its parameters are tightening and tightening, clinging onto some kernel of middle-class-ness that presents social dysfunction with a Channel 4 level of voyeurism. It seems that the crime novelist’s task of exposing ‘unseen’ corruption is really one of talking about the things people don’t like acknowledging – and even that has become watered down in the last decade or so. When this is your frame of reference, as an author, reader, or publisher, you’re complicit in a level of generic elitism, no matter how noble or important your aims.